Mark your calendars to attend the 2019 NFCA Fireproofing Educational Conference! The Hilton Orlando Lake Buena Vista is a Disney Property, walking distance to Disney Springs and within a few miles of Magic Kingdom, Epcot and Disney's Hollywood Studios. NFCA Contractor Accreditation Program Training will be held March 18-20, 2019 in Orlando, prior to the conference. NFCA Webinar Series - August Webinar to be announced. NFCA Fire Resistance in Buildings Seminar in September in Denver. Details coming soon! If you don’t use these on your scaffold and/or you don’t know what they are, you could be subject to big fines! 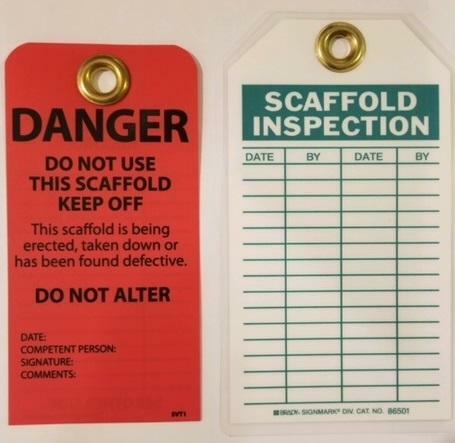 Scaffold Inspection Tags should be used and should be signed off on daily by the designated responsible person in charge of scaffold erection and inspection. If this is not standard practice in your daily safety routine, it should be. The below listed websites provide valuable safety information and will help you stay up to date on what is happening in the construction industry and current safety issues. NFCA Safety Tip of the Month Program gives NFCA Contractors the opportunity to share and learn safety actions being used on job sites that work and contribute to job site safety. Email NFCA a safety issue you had and how you solved it. NFCA will choose one “Safety Tip of the Month” to share in the NFCA Enews. Win a NFCA Shirt if your safety tip is chosen! Sandy@nfca-online.org . Congratulations to NFCA Contractor Member Superior Industrial Insulation Company, Cleveland, OH, for becoming a NFCA IFRM and SFRM Accredited Contractor. Superior Industri a l is one of twenty-three contractors who attended the Contractor Accreditation Program Training in San Diego in March. NFCA is active! NFCA has submitted NFPA Code Proposals, ICC Code Public Comments, participated at a Fire-Resistance Symposium in Bogota, Columbia and are working on the NFCA Fireproofing Book. And, we communicate with many members and interested specifiers and building code officials daily. NFCA & ICC Code Public Comments – NFCA had a very successful ICC Committee Action Hearing at Columbus, OH. Our concepts that special inspection for fireproofing take place before rough plumbing and electrical installation, and during installation, were well received. Look for NFCA’s public comments to focus on limiting inspection to 110% of the amounts of inspection listed in ASTM E 605, and a change to the title from Intumescent Mastics and Coatings to Intumescent Fire Resistive Materials. Look for more on this as the fall unfolds. NFCA at ASTM – NFCA is working on the ASTM Fireproofing Inspection Standards. These new documents will be a industry consensus standard that reflects the best of the best in fireproofing knowledge. Look for another round of voting in September. NFCA Follow up with AISC – NFCA President Jonathan Wohl and Vice President Martin Rodriguez travelled to New Orleans and gave NFCA input to the American Institute of Steel Constructions’ “Innovation Conference”. The report of the meeting stated that AISC wants to study Performance Based Design in more detail. Look for a session on Performance Based Design from NFCA in the future. NFCA has had calls asking about the specification process of fireproofing, and issues such as who declares Restrained (or) Unrestrained Fire-Resistance-Rated Assemblies. The 2015 International Building Code, in a new section 703.2.3 sentence, states that “Restrained construction shall be identified on the construction documents”. This topic is always lively when discussed at conferences and webinars. Look for another session soon. ﻿NFCA Membership total is 141 , made up of 111 Contractor Locations, 22 Associate Members and 8 Manufacturer Suppliers. Not a member? Join today! Click here for Membership Information . Membership Special! Contractor Membership is $500 for the rest of 2018!